Hawaii Tourism Record-Breaking Year 2013 — Jack Tyrrell & Company Jack Tyrrell specializes in Kakaako, Honolulu, Hawaii luxury condo projects. 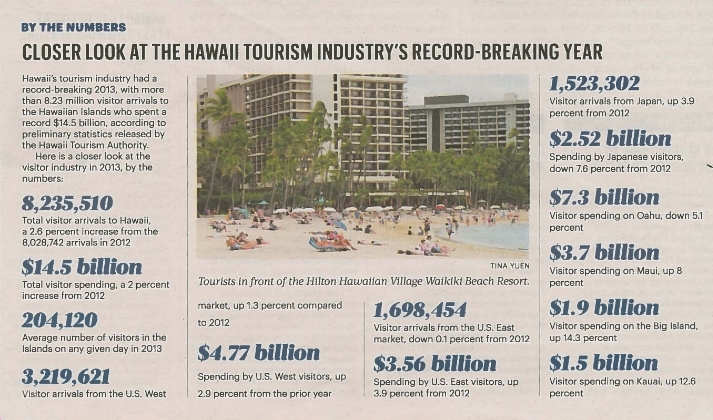 Hawaii's visitor industry set records for visitor spending and arrivals in 2013 despite a leveling off of growth in the second half of the year. 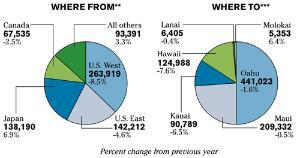 Nearly 8.24 million travelers came to Hawaii in 2013, surpassing the 2012 record of nearly 8.03 million visitors by 2.6 percent, according to the Hawaii Tourism Authority. Visitor expenditures rose to $14.5 billion, a 2 percent gain over 2012. When adjusted for inflation, total visitor expenditures in 2013 still set a record but rose by only 0.3 percent. "While we were pleased that we surpassed our 2012 record numbers, we fell short of our 2013 targets," HTA President and CEO Mike McCartney said in a written statement. Total arrivals in 2013 were 2.9 percent below the HTA's target of nearly 8.5 million visitors, and total spending was 5.1 percent lower than the $15.3 billion goal. To be sure, the only reason that the state's visitor industry set records in 2013 is that gains in the first half of the year were strong enough to offset weakening performance during the second half. In December, the fourth consecutive month to record dropping arrivals and spending, year-over-year visitor expenditures fell 6.3 percent to $1.3 billion. December visitor arrivals fell 1.9 percent year-over-year to 722,423. December, which is typically busy because of the Christmas and New Year's holidays, was off because visitors elected to book shorter vacations and spend less per day. Daily spending in December was down 3 percent to about $189 per person, and the average length of stay fell 1.65 percent to 9.85 days. The December daily spending patterns more or less reflected annual daily spending patterns. On a daily basis, visitors in 2013 spent 10 percent more on lodging than they did in 2012 and 4.2 percent more on transportation; however, the amount that they spent on shopping declined by 20.4 percent. "Besides cutting down on shopping, some visitors also have elected to cut their stay short, and that's snowballed into what we are seeing in terms of total spending," said HTA Director of Tourism Research Daniel Nahoopii. Laura Arnsdorf, a visitor from Victoria, British Columbia, who was playing with her 3-year-old son, Ryan, on Wednesday in the sand outside of the Hilton Hawaiian Village Waikiki Beach Resort, said she noted the high cost of a family vacation to Hawaii. "Hawaii is the ideal location for Canadians to visit if they can afford to come. It's more expensive than other destinations that have all-inclusives, but we think that it's worth it," Arnsdorf said. "We've been to Mexico and we've gotten sick. Hawaii is a great family location." The isles are also a great place for young adults, said Los Angeles-based visitor Kelly Gappa, who picked Waikiki for a girls trip to celebrate her 30th birthday. "We've been here five days and we've had no disappointments. Everything is just beautiful," said Gappa, who was fresh from a trip down the water slide. "This vacation was too quickly gone." Hawaii's visitor industry could say the same about last year, which bolstered businesses throughout the isles. "We benefited from Hawaii's record year for tourism with our own record-setting year, as more than 600,000 visitors came to tour the Battleship Missouri Memorial, a 10.8 percent increase from the year before," said Michael A. Carr, president and COO of the Battleship Missouri Memorial. "We were fortunate in that our visitor counts stayed strong throughout 2013, and we really didn't see any significant drop-off as the year went on, which I attribute to our affordability as a tour attraction and the USS Missouri's historical prominence in making the most of the Pearl Harbor visitor experience." This year could be more challenging for tourism businesses, which are less likely to experience the kind of momentum seen in the first half of 2013. Prior to the September 2013 downturn, the Hawaii Tourism Authority set a goal of bringing nearly 8.8 million visitors to Hawaii in 2014 and getting them to spend nearly $16.1 billion. However, McCartney said that the HTA now anticipates the slowdown, which began in the back half of 2013, to continue into the first half of 2014 with impacts especially felt in typically slower months like April and May. "Fluctuations in currency exchange rates, taxes and fuel surcharges have slowed bookings and hampered growth, causing a leveling off throughout the second half of 2013," McCartney said. Air seat volume, which rose 5.4 percent in 2013 and is anticipated to rise only 1.8 percent this year, also could contribute to further slowdowns. Jerry Gibson, area vice president of Hilton Hawaii, said the hotel chain has seen a drop in Japanese visitors. "We're seeing a double-digit drop in that market for the first quater compared to last year," Gibson said. Hilton, which has felt the impact of a weakening yen, is now closely watching to see how an April sales tax hike in Japan plays out in Hawaii. "Their tax on all goods and services will go from 5 percent to 8 percent," Gibson said. "As they are a saving economy, we don't know how it would affect them." Barry Wallace, executive vice president of Hospitality Services for Outrigger Enterprises Group, said 2014 is hardly "doomsday" for the state tourism. "You can't have a record year every year. It's just not practical for a mature destination," he said. "Overall, we are doing very well, but the softness from the second half of the year has continued into the New Year and I think it will extend into the next few years."